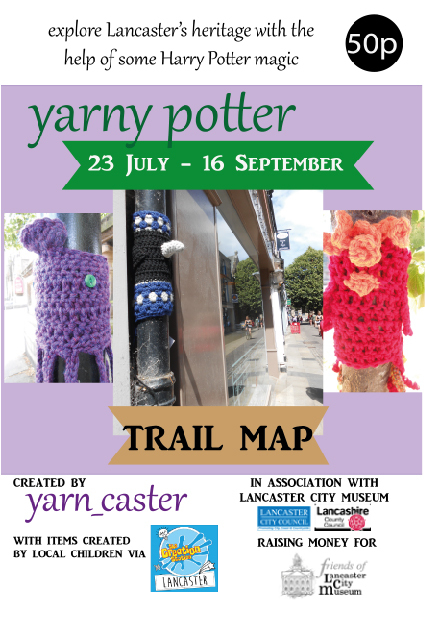 Join us here and in Lancaster from the 23rd of July – 16th September 2018 for a magical yarnbomb trail inspired by Lancaster City Museums Harry Potter exhibition. Keep you eyes peeled for woolly cozies on street furniture. Check their tags for some fun facts. We’ll be highlighting some of Lancaster heritage and sharing the Harry Potter magic. All whilst raising some cash for the Friends of Lancaster City Museum. Trail sheets are available from Lancaster City Museum’s shop for just 50p. There’s a raffle running throughout the event and special weekly competitions on social media.